The Pavilion 590-p0040 Desktop Computer from HP provides performance and storage within a sleek design that cuts down on size. This system is powered by a 3.6 GHz AMD Ryzen 5 2400G Quad-Core processor which will allow you to run multiple applications simultaneously. The 8GB of 2666 MHz DDR4 RAM helps to ensure smooth multitasking and also allows the computer to quickly access frequently used files and programs. The processor can be overclocked to 3.9 GHz and the memory can be upgraded to 32GB using a 2 x 16GB configuration. For storage of your files, a 1TB 7200 rpm SATA III 3.5" hard drive offers quick access to your data. If you want to add external storage drives or other peripherals, the Pavilion 590-p0040 features one USB 3.1 Gen 1 Type-C port, two USB 3.1 Gen 2 Type-A ports, four USB 3.1 Gen 1 Type-A ports, and two USB 2.0 Type-A ports. The integrated AMD Radeon Vega 11 Graphics chipset delivers a sharp, clear picture, while allowing external displays to be connected using its HDMI and VGA ports. Connect to the Internet using wired Gigabit Ethernet or wireless 802.11ac (1x1) Wi-Fi, and additional wireless peripherals can be paired using Bluetooth 4.2 technology. Whether you are listening to music, watching a movie, or playing a game, the 590-p0040 outputs 5.1-channel surround sound and delivers higher fidelity than standard audio controllers. HP's Pavilion 590-p0040 Desktop Computer includes a wireless keyboard, a wireless mouse, and a power cord. It operates using an internal 180W power supply. The installed operating system is Windows 10 Home (64-bit). Tap into powerful desktop performance with Zen architecture that delivers improved multi-threaded processing and Vega graphics for intensive multimedia tasks. Grow your digital collections and still have room left over with 1TB of storage. Smoothly stream content and play your favorite games. With its higher bandwidth, everything from multi-tasking to playing games gets a performance boost. Stay connected to Wi-Fi and to Bluetooth accessories with fast and reliable wireless technology. This system has all the necessary ports for immersive sound quality with 5.1 surround sound. Charge, transfer data at 5 Gb/s, or connect a display from one reversible port. Transmit digital HD video and sound to an external display. If you don't have it today, sign up to get 25GB of Dropbox space free for 12 months with your HP device. Box Dimensions (LxWxH) 19.4 x 14.9 x 11.1"
Does this PC have Free Slots available to add RAM and a Graphics card? Thanks. 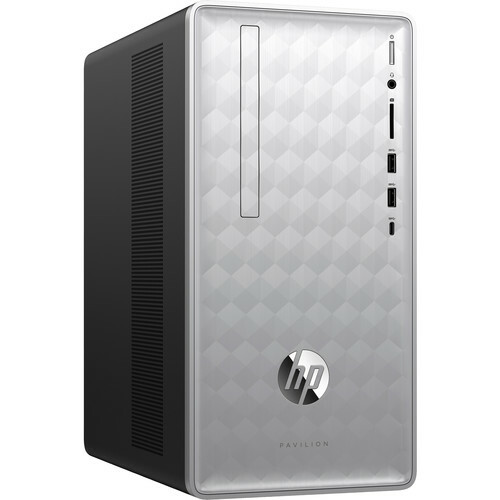 The HP Pavilion 590-p0040 Desktop Computer B&amp;H # HEPV590P0040 has 2 available RAM slot and a free PCIe slot for a graphics card. One of the RAM slots is used by the pre-installed 8GB RAM module.